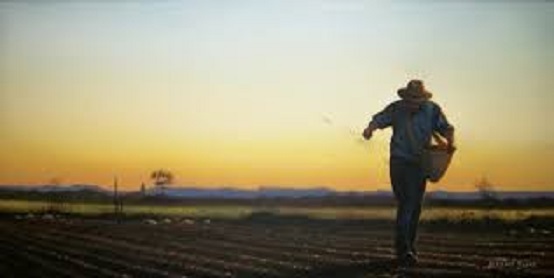 A Sower Went Forth to Sow . . . I have been an active blogger for almost five years; as I suspect is true of many bloggers, I am obsessed with my blog statistics. One of the most important numbers provided by Google Analytics is my blog’s “bounce rate,” defined as “the percentage of single-page visits (i.e. visits in which the person left your site from the entrance page without interacting with the page).” My bounce rate tends to hang around 75-80%–I don’t know if that’s good or not, since I don’t have the nerve to ask other bloggers and risk finding out that the norm is around 25%. Such numbers confirm something that any writer knows—writing is an inefficient and non-economical process, if efficiency and economy are measured numerically. One never knows when or if something one throws out for public consumption will hit pay dirt and actually have an impact. I was comforted to be reminded by last Sunday’s gospel that I’m not the only person who spends a lot of time in an inefficient enterprise. Not only is seed scattering hit-and-miss, it is by no means certain that those who read a text will interpret it in a manner that matches up to the author’s intention. Indeed, post-modern literary theory points out that the meaning of a text is always a function of the text and what the reader brings to it—the original intention of the author may play little to no role in the text’s meaning for the reader. Furthermore, the author’s intent should not be looked to as a standard for correct interpretation, even if we know what the original intent was. I’m actually very comfortable with this, but found out over the past week that a lot of people aren’t. Him: I like it, but I would be very cautious about advocating for collateral interpretations, when it’s clearly not the intended meaning. Me: Maybe it’s the effect of post-modernism on me, but I’m far less concerned with the “original meaning” than with how it can speak to contemporary persons. The meaning of a text is as much the function of the reader as of what is being read. Me: I know the Greek [I get to use it on a semi-regular basis in my professional life]. Locking oneself into the literal meaning of the original locks one into never allowing a text to become alive to new possibilities and interpretations. Remember, btw, that Jesus spoke in Aramaic, not Greek, so what is in the original written text is already a translation and an interpretation. Him: It’s a nice word play, but what about Christians who don’t speak English? Me: Then they will find new interpretations and meanings available uniquely in their own languages. I’ve encountered many of them in French translations of the Bible, for instance, that don’t play in English; there are also many word plays in the original Greek that don’t translate into English. Overall, the meaning of a text is as much about the reader as it is about the text. And so it went. I really am not as cavalier about an author’s intention as it might sound, but I realize—as the parable of the sower points out—that once the seed is out there, what will happen is pretty much out of the sower’s control. And, despite the protestations of any number of Facebook commenters, I’m really okay with that (and so, apparently, is God). One particular person wouldn’t stop pushing back, eventually suggesting that I wouldn’t like it if it turned out that something I wrote had been as badly misinterpreted as I was misinterpreting “My burden is light.” Before I had a chance to respond, someone responded much more eloquently than I ever could have. As one who writes quite a bit, I’d just say this. If anyone is moved to a new understanding by anything I’ve written, even if it wasn’t the point I was trying to bring out when I wrote it, I’m grateful. The Bible is like that. I can read a passage one day, then read the same thing a week later and have a totally different experience with the text. Words are magic. Every day when I throw new e-seed out there, as well as on days when I throw out recycled e-seed, I am imitating a divine activity that makes no sense but somehow occasionally produces fruit in the most unexpected and unpredictable places. This entry was posted in Uncategorized on July 19, 2017 by vancemorgan.